How can you make your dreams of taking the ultimate luxury Caribbean vacation come true? It’s much easier than you might believe. With so many Caribbean islands to choose from, there’s no shortage of space in the Caribbean, even though it might seem like this tropical destination gets crammed with visitors during certain times in the year. The thing is, you just have to know how to pick the right place. Cancún, Punta Cana, Jamaica, Puerto Rico… those are some of the most popular Caribbean vacation spots. If you value privacy and serenity over everything else, you’ll definitely want to avoid those places, especially during the high season (around Spring Break and Christmastime). In fact, some of the Caribbean islands with reputations for being the “most luxurious” are also some of the most “unknown”. For example, many celebrities choose St. Barths for a luxury Caribbean vacation, due to its beautiful secluded beaches, top luxury resorts and villas, and the fact that it’s not one of the most popular Caribbean destinations. St. Barths: European sophistication combined with an easy-going, laid-back lifestyle makes this island a favorite among celebs. Aruba: This small yet incredible island is home to Tierra del Sol, a prestigious community of luxury houses and villas. St. Martin: This idyllic island situated 300 km east of Puerto Rico has plenty of luxury villas and more than 500 duty-free shops. Barbados: There are plenty of private places to relax on this tranquil island. You’d be surprised to know that Fitts Village, once a quiet fishing town, is now home to amazing luxury accomodations. Suriname: Looking for somewhere exotic, unique, and yet still luxurious? That’s Suriname, a South American country with a Caribbean coast. Curacao: Eclectic and historic Dutch colonial towns make this Caribbean island quite the charmer. You’ll find no shortage of luxury villas there, nor fabulous beaches, both private and public. Belize: Costs are low in Belize, so you just might be able to get a deal on luxury accomodations. And, plenty of “experiences of a lifetime” await you, like a helicopter flight over the famous Belize Blue Hole. Also, you can even rent your own private island off the coast of Belize. Turks & Caicos: A luxury Caribbean vacation in Turks & Caicos is like taking a trip to a deserted island that still has all the opulent amenities you’re looking for. These tiny islands are so secluded that you might even forget that civilization still exists once you’re there. You might think that an all-inclusive resort is your best bet when it comes to a luxury Caribbean vacation, but there’s actually a much better option: rental villas. Outdoor space for private events, like weddings. Full kitchens in which to cook meals, or have them cooked for you. Basically, rental villas offer everything that hotels do, but also so much more. You can find them in all sorts of styles, and in many sizes. Some will accommodate just two to four guests, while others have space for twenty! 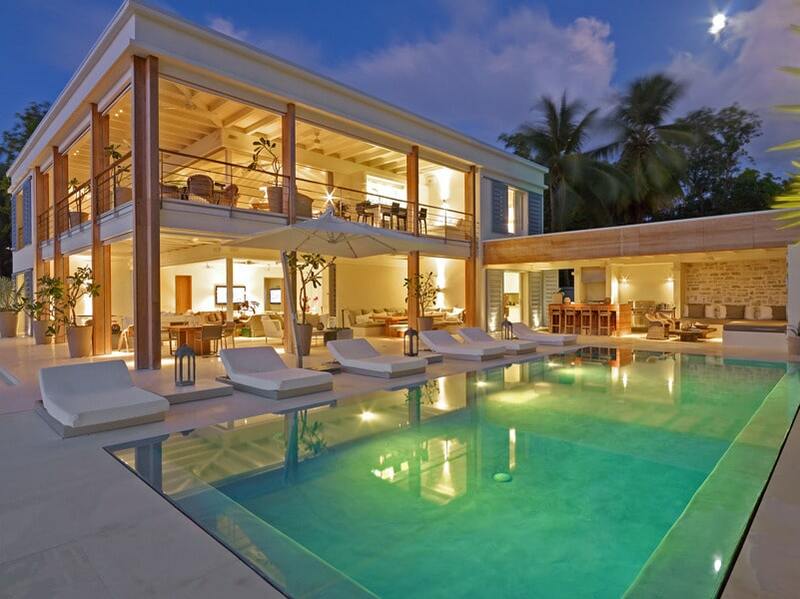 You can find a large variety of rental accomodations for your luxury Caribbean vacation to suit any style. Some feature modern decor, others are built in a style reminiscent of the historic colonial days of the 18th and 19th centuries. Browse through our favorite properties below to get an idea of the fantastic options that await you! Yes, you read that correctly. KeyCaribe’s Magnificent Mansion in Noord, Aruba actually sleeps 25 guests. With 8 bedrooms and 11 bathrooms, everyone will feel perfectly at home and at ease. The Magnificent Mansion is the perfect place to hold a wedding, since your entire wedding party can stay right on site! Click here for more details. 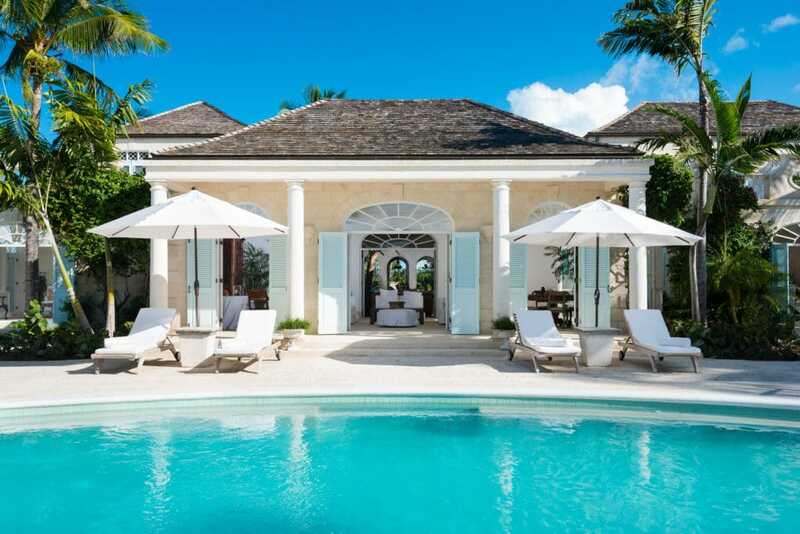 The Coral House in Turks & Caicos is an architectural masterpiece styled after 18th century island plantation estates. With 5 bedrooms and 5 bathrooms, it can easily accommodate 10 guests. The estate includes all the amenities you require for the perfect luxury Caribbean vacation, including a heated swimming pool, a beachfront view, and an outdoor dining area. In case you’re worried about cleaning and cooking, there’s no need to do any of that– the estate provides personal chef, butler and housekeeping services. 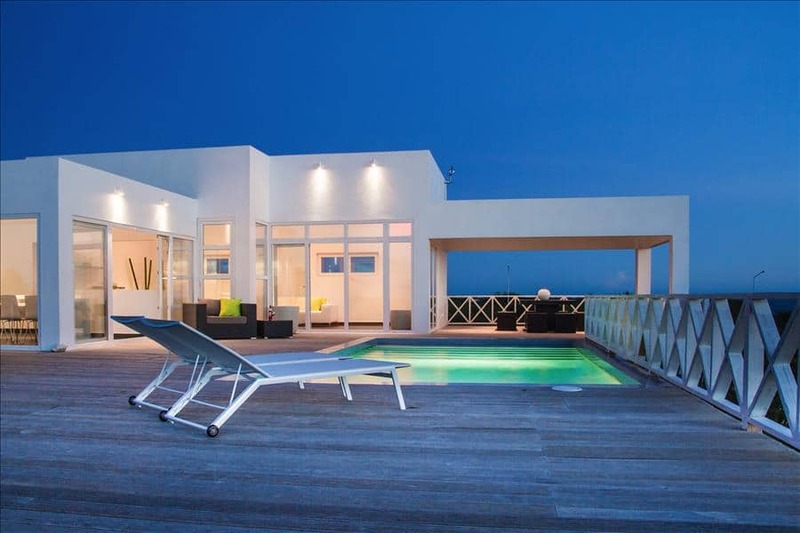 This modern villa in Jan Thiel, Curacao was built for those who love simplicity and modern decor. With 4 bedrooms and 4 bathrooms, this lovely house has plenty of space for 8 guests. 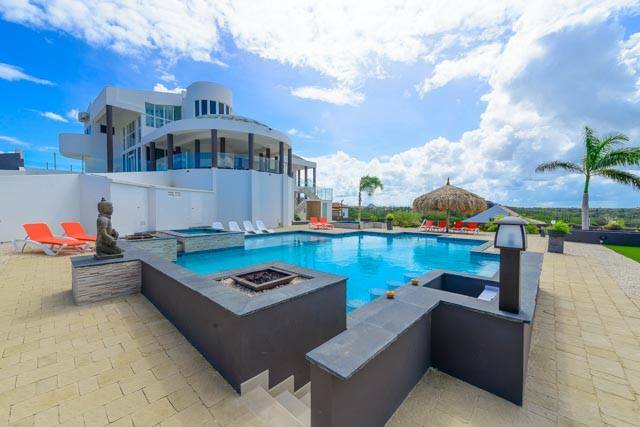 Besides a great seaside view, this villa also has all the luxury amenities you could dream of, including a pool, a full kitchen, and concierge services. The best way to make your Caribbean vacation dreams come true is by planning ahead. You can often save on flights by booking at least 3 months in advance. In addition, it’s best not to wait too long to book your accommodations, as luxury villas tend to rent fast. You can also plan your activities ahead of time so that once you reach your destination, you won’t ever have to waste time figuring out what you’ll do next. Read the Key Caribe blog to discover the exciting activities available on the island of your choice. Or, you can simply ask a Key Caribe concierge to book the best excursions for you ahead of time. In addition, one very important part of Caribbean travel that is often overlooked involves packing your suitcase. Tropical weather requires a certain type of clothing: it should be light, breathable, and preferably made of natural materials like cotton in order to wick away odors. For more information, read What to Pack for a Trip to the Caribbean . We hope to see YOU in the Caribbean soon! See special offers on luxury villas here.